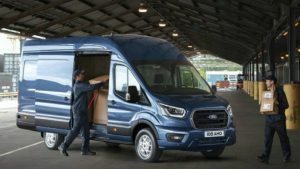 New 2-tonne Ford Transit improved fuel efficiency by up to 7 per cent and advanced new connectivity features. Segment-first diesel mild hybrid powertrain option further improves fuel efficiency by up to 8 per cent in stop-start urban situations. New powertrain includes upgraded 2.0-litre EcoBlue diesel with more powerful 185 PS variant, plus efficient new 10-speed automatic transmission for rear-wheel drive models. On-sale from mid-2019, new Transit features smart new front-end design, all-new interior with enhanced stowage, and new driver assistance tech to make working days less stressful. A new Power Side Load Door also provides ease of operation when loading or unloading. The new high-mounted down-lighter provides illumination of the cargo area when working at night behind the rear cargo doors.